For over 110 years, Woodmansee's has been styling individuals of all ages, making each shopper and gift-receiver feel beautiful. We offer a wide variety of fair-trade and locally crafted clothing, jewelry and accessories. Our Woodmansee's girls are always warm and welcoming, making our customers feel at ease. We are more than happy to assist you in finding your perfect look! 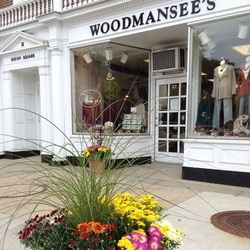 Woodmansee's, nestled on 27 Broad Street in the historic downtown Westerly, RI shopping district, offers a unique experience for the discerning shopper. During your visit to Woodmansee's ask for Maria Lenihan, second-generation owner and buyer, for expert styling advice for any event or occasion. See something you love on our website but can't make it to the store today? Call us or use our "Contact Us" form. We're always happy to answer any questions you may have. Woodees, our sister store, is located right next door. Owned and managed by Anna Lenihan, Maria's daughter, Woodees captures the upbeat spirit of girls, teens and young professionals with a fun and fashionable line of clothing, jewelry and accessories. A Woodees girl is "one who dresses for themselves with exceptional confidence all while maintaining a youthful, flirty personality with a bit of a wild side while making their dreams come true."